East Gallery House is a 4 bedroom house in Melbourne’s eastern suburbs. To the rear, the plan is opened up to create an art gallery like experience with white walls, timber floors and sliding art screens. To the front, the original art-deco features have been preserved and restored. Old and new have combined to create a home which reflects the client’s lifestyle and passion for art. The clients are a couple with children now in their early twenties, realised that rather than requiring more space, they needed to update and improve their existing spaces. 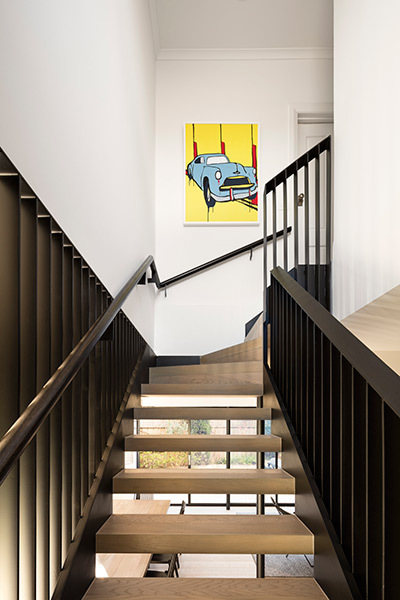 The renovation also had to accommodate the client’s growing collection of art within the new and old sections of the house. Inspired by art storage racks these steel screens accommodate our client’s growing art collection. 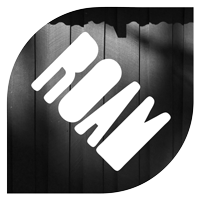 Made from black steel and metal mesh, they allow the art to be easily changed and also work as a flexible room divider. They respond to the challenges of how to display art in an open plan layout where wall space is limited. The pull handles are wrapped in leather bike handle tape (made in Melbourne) which is a reference to the client’s keen interest in cycling. Not wanting to significantly reconfigure the first floor, we knew we needed to redesign the stair to allow views out and maximise light, without moving the stair well. 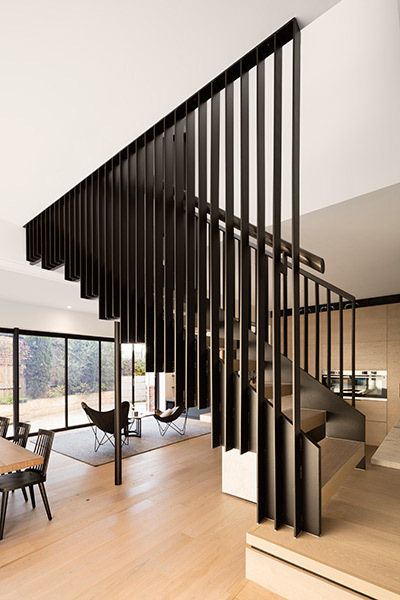 A black steel and timber stair rises from a timber platform. Open treads allow light and views. The black steel ‘slats’ connect visually with the art screens and provide an element of screening to the upstairs corridor and bedrooms. White walls, black steel and timber floors combine to create a gallery like look & feel.